Our busy city lives often get in the way of romance. But that needs to change ASAP, doesn’t it? Thankfully Cupid and resorts around the city are in agreement with us. So, when you are looking for a romantic vacation, you don’t have to venture too far. The outskirts of the city are dotted with resorts that offer the perfect, romance-charged escape. Bookmark these romantic resorts around Bangalore for your next getaway. A spiffy resort that’s surrounded by coconut groves and greenery, Windflower makes for a charming getaway. We recommend that you book one of their plush villas and get cosy. When you have to venture out, there’s a luxury spa and also lavish dinners that you can look forward to. Located near the historic ruins of Talakad, this a serene escape that sits on the banks of the river Kapila. They offer picturesque, eco-friendly cottages that are nestled in a lush setting. To up the romance quotient, you can go for long walks by the river or even enjoy a canoe ride. In the evenings, you can tuck into a sumptuous barbeque before cosying up by the fireplace. Looking to combine romance and luxury? Then, make a reservation at this swanky resort. You and your special someone can kick back in plush rooms and take in the scenery from your private balcony or terrace. When you are in the mood for a pampering, you can swing by their spa or feast at their restaurants. Do ask for their special couple packages when you call them up. Horse around with your beloved at this unique getaway. While this is first and foremost a riding school, they do offer spiffy tents and also suites for guests (these include love-starved couples). The charming setting includes walking trails and you can even spend your time petting the gorgeous horses here. When hungry stop by Ai Cavalli – their in-house Italian restaurant. For those of you who think romance and fun should go hand-in-hand, this resort near Talakad is the answer. Surrounded by hills and the backwaters of the river Cauvery, you can park yourself at the cheerful rooms here. You can also team up with your mate for banana boat rides, river cruises, and rain dances. The floating restaurant and the night-time bonfires also add to the romance. Rustic and stunning, Our Native Village spells romance from the word ‘go!’. The eco-friendly resort makes for a tranquil escape far from city life. Their rooms are adorned with folk art and when you want to venture out you can take long walks around the property that features lily-pad filled ponds, green pathways, and cosy nooks. The outdoor restaurant and the spa are great places to stop by too. Located not far from the airport, this swanky retreat is the answer to your romance-filled dreams. Their posh rooms are perfect for a loved-up night. And when you want to take the romance elsewhere, you can lounge by the gorgeous pool or dig into a lavish meal at their in-house restaurant. Popular with the crowds, this resort offers charming, tented bungalows that reek of romance. Close to the airport, the place also has gazebos and a pool where you can soak in the love, drink in hand. In the evenings, you can settle in for a memorable meal at any of the resort’s restaurants. 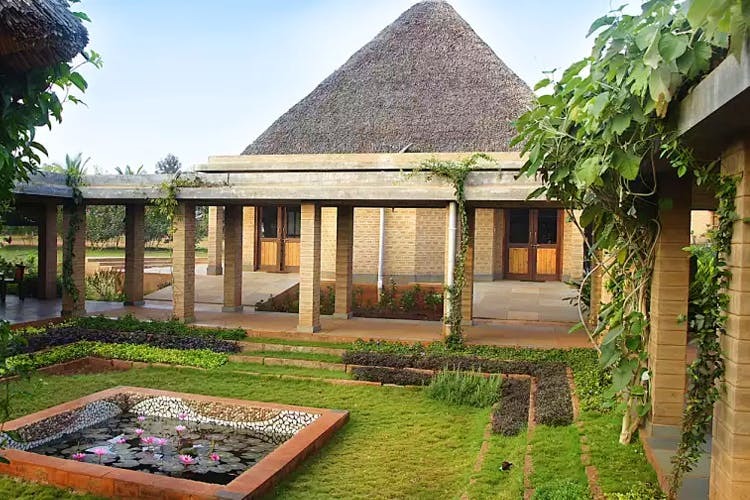 Angana is spread over two acres, with beautifully-kept lawns and greenery. The main structure is an ancestral home, with six rooms, constructed out of grey stone work, giving it a lovely heritage feel. The centre courtyard is a great place to relax with bae, or better still with other fellow couples if you are on a double date! On the other side, are two cottages overlooking a well-manicured lawn with a single bench beautifully placed under a huge tree in a corner. We love the swimming pool though, that is like a temple-style pond with steps leading down to the water’s edge. Dial up the luxury, and celebrate a romantic milestone at Clark's. Located in the the posh Swiss Town gated community in Devanahalli, you and bae can lounge by the pool without worrying about nosey aunties or city stress. Knowing our urban problems, the hospitality team specially curated weekend packages offering services be it for relaxation, entertainment or pampering no matter what your age is.